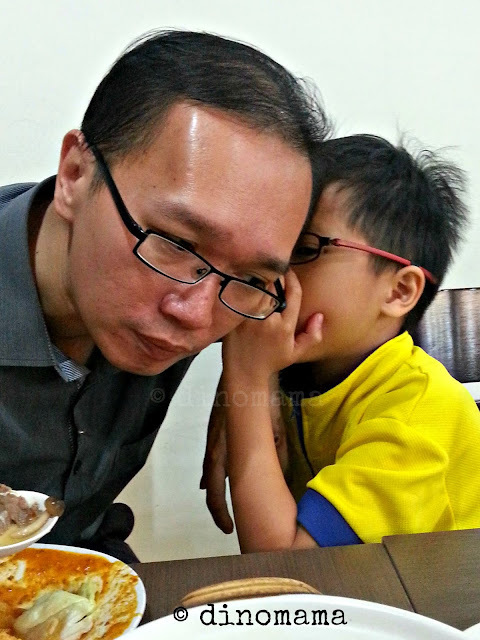 On 18 July 2013, while we were having dinner, DinoPapa and DinoBoy who were sitting opposite me started to whisper into each others ear. I asked them and both of them gave me a sweet sweet smile, the boy even said "It's a secret Mum." O-kay... Secret... I guess there are some stuffs that sons only share with dads. Later on, the boy whispered a little bit too loud and I caught the conversation; he was asking the dad to help him make a birthday gift for me~ Surprise Surprise! So I waited patiently for the surprise from my husband and boy while pretending NOT to know anything about it. As the day draws near, I started to celebrate it with friends AND food! So touched that these 3 friends; Adeline, Regina and Diana came all the way down to my work place to have a steamboat lunch with me on 25 July 2013 as I couldn't take leave for that day. On top of that, they knew I had only an hour of lunch so they cooked the food and put it on my bowl, I was able to start pigging the minute I sat down *so blessed* Look how big piece is that beef! Yum Yum! Good food, good gossips, good laughs, good companions. What more can a girl ask for? The next day I had steamboat again with another 2 August babies. 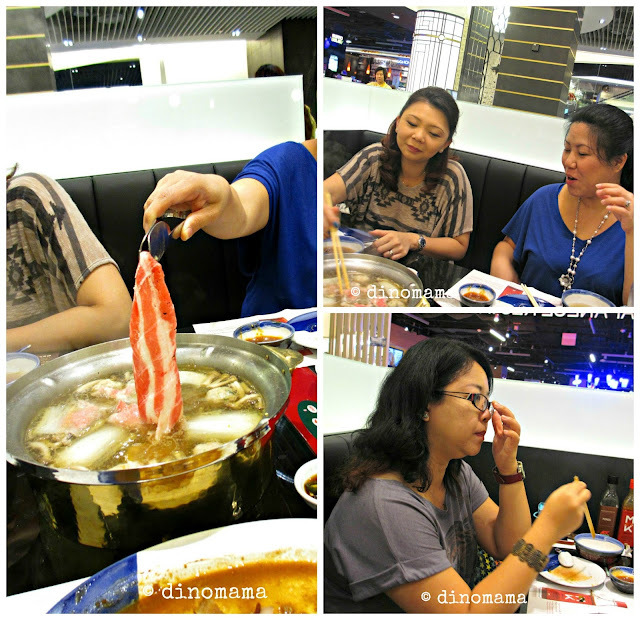 We had steamboat again and exchanged birthday gifts. Look at the beauty products I got! More things to pamper my face~ As promised I made the No Bake Cheesecake for them with ganache, the cheese was soft and melted as it was out of the fridge for 1.5hours before we ate it but nonetheless they both like it a lot. I'm glad that the chocolate cheesecake turned out well as that was the 1st time I made ganache. 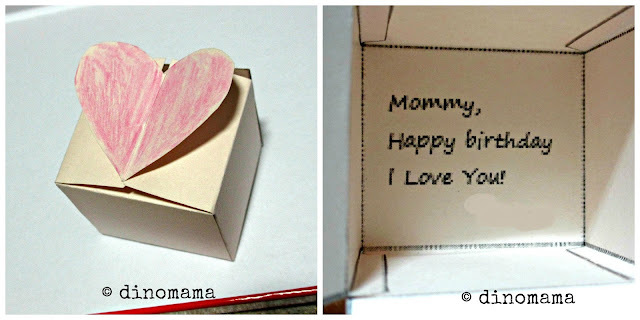 The conspiracy that started 2 weeks ago came to light yesterday when my very eager & excited son presented to me this lovely handmade box with a pink heart on it and a lovely message from DinoBoy inside the box. DinoPapa was the one that made the box, he must have downloaded the template from the net and made it before I got home. So creative of him to think of this instead of buying a small box, loved it because he has never made something for me. And in the box is this beautiful handmade gem stones necklace~ Pretty right? DinoBoy told me that he bought the $1 packet of sticker gem stones from the school bookshop. 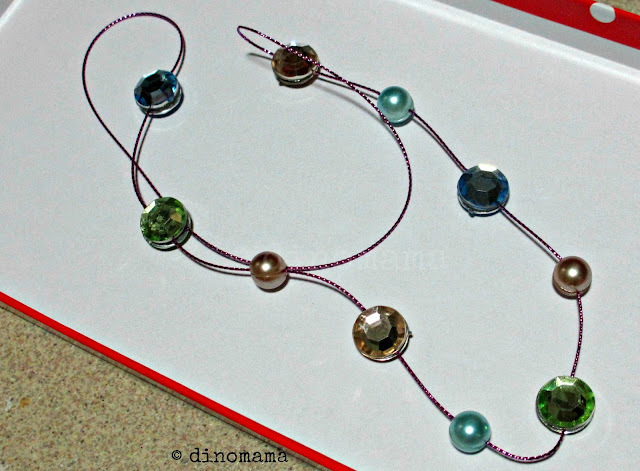 DinoPapa helped him to find the string and together they made the necklace by sticking the gem stones back to back onto the string. Creative and innovative right? They really look like gem stone beads from far. Its near mid day, my birthday is almost half gone and even though I was unable to take leave from office to laze at home like previous years I am very happy because I celebrated it with so many friends. Most important is DinoPapa and DinoBoy made it extra special to me with the handmade gift. Nothing can match up the love and the necklace from them! Happy Birthday!!! The special day is always a special day. With that bling bling necklace and thoughtful friends around you, the year ahead is sparkling^^! The necklace is so awesomely creative! 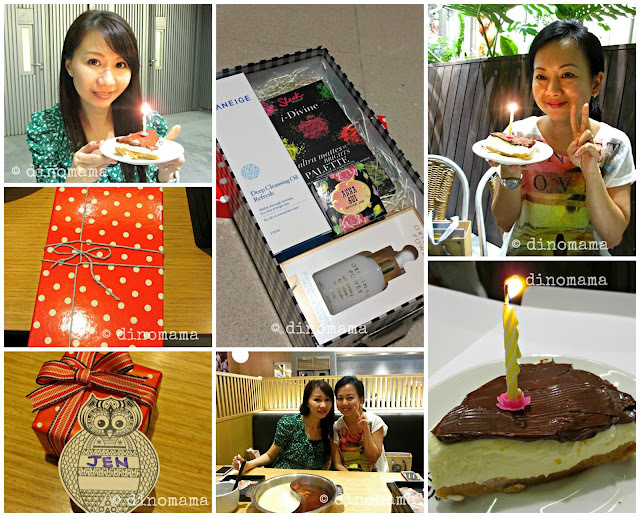 it's a very sweet gift.. happy birthday!! Happy birthday! Sure looks like it was a wonderful day! Mmmmmm! Steamboat! My favourite! Shiok! That is an awesome necklace, good job, Z! Ohhhhh im so envious of yr necklace!! Happy Birthday dinomama!! Dinoboy's present to you is so uber sweet!!! ...and it was good to catch up, even for awhile. Happy burstday, Jen!